ISTANBUL, Turkey (CNN) -- Rescuers dug frantically with their hands, trying to save trapped victims after a powerful earthquake struck western Turkey on Tuesday, killing at least 500 people and injuring some 2,500 others. The quake's epicenter was near Izmit, some 65 miles (104 kilometers) east of Istanbul, where an oil refinery was in flames. Casualties were reported high in the nearby town of Golcuk. The National Earthquake Information Center in Golden, Colorado, said the quake had a magnitude of 7.8, making it nearly as powerful as the 7.9-magnitude San Francisco quake, which killed 700 people in 1906. Offers of help poured in from around the world, hours after the extent of devastation became clear. The United States, Japan, and many European countries, including Russia, offered aid. In Istanbul, a metropolis of 12 million people, at least a score of buildings collapsed; survivors were unearthed from the rubble and rushed to hospitals. Preliminary accounts put the injury toll there at 500. U.S. Energy Secretary Bill Richardson, who was visiting Istanbul when the quake struck, told CNN his hotel shook, and the lights and power went out. "It's pretty chaotic," he said. In Izmit "You see a lot of devastation: Mothers with babies that are being dug out." Istanbul officials said the toll of deaths and injuries was increased by falling masonry, and by people hurling themselves from balconies and out of windows in panic. A Turkish naval base on the Marmara Sea was badly damaged. Latest reports from the state-run Anatolian news agency said 325 people died in the Marmara region, and the toll was expected to rise. Turkish Prime Minister Bulent Ecevit told reporters that an estimated 200 people were still trapped under rubble at the naval base. "It is becoming clear that one of the most badly hit areas were the Naval Forces facilities at Golcuk," Ecevit said as he emerged from a crisis center established in the capital, Ankara. "Golcuk was right on the fault line. There was a handover ceremony there yesterday and there were a lot of admirals and naval officers. Most of them stayed at Golcuk," Ecevit said. The Marmara Sea facilities are the heart of the Turkish navy and a regular port for most of the country's warships. Most of the dead appeared to have lost their lives as apartment blocks in many towns and cities gave way and collapsed into piles of rubble and tangled metal. Rescue workers and distraught survivors were wrestling with the concrete, trying to free those still trapped. Turkish journalist Fatih Turkmenoglu told CNN that warnings had been issued about many of the buildings which collapsed -- they were not considered sturdy enough, or able to withstand earthquake damage. "Everyone was warned about it," Turkmenoglu said. "The buildings were not really good enough." "They can hear the voices of my mother and sister but know nothing about my father and brother," said Arsu Yilmaz as she watched rescue workers digging at a building in Avcilar district. A five-year-old girl was extracted from the rubble unharmed. Heavy casualties were also reported in the cities of Bursa, Eskisehir and Bolu. A seven-story building collapsed in Eskisehir. An oil refinery burned in Izmit, authorities said. In the northwestern city of Bursa, another oil refinery caught fire and a number of people were reported killed. Doctors at Istanbul's Kartel hospital said they were treating about 100 people injured by falling rubble. Local radio reported the quake damaged at least 21 buildings, and caused injuries and gas leaks that had erupted into fires across the city of 10 million. The powerful tremor stuck at 3:02 a.m. (8:02 p.m. EDT Monday), cutting power and communications to much of the area. CNN freelance reporter Andrew Finkel was shaken out of his sleep. "The house was shaking violently," he said. People in Istanbul have left their buildings and are standing in the street, he said. There was no electricity in his area of the city, on the Asian side of the Bosporus strait. Much of Turkey sits on an earthquake prone zone known as the Anatolia fault. 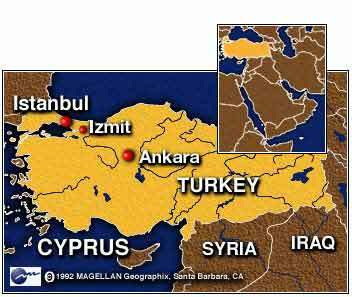 Izmit also sits on the fault line, said Ali Pinar, an official from Istanbul-based Kandilli observatory. A 6.3-magnitude quake that struck Turkey on June 27, 1998, killed 144 people and injured over 1,500 in and around the southern city of Adana.